Fortnite's daily mobile revenue has spiked to $1.8 million since lifting the invite-only requirement earlier this week. 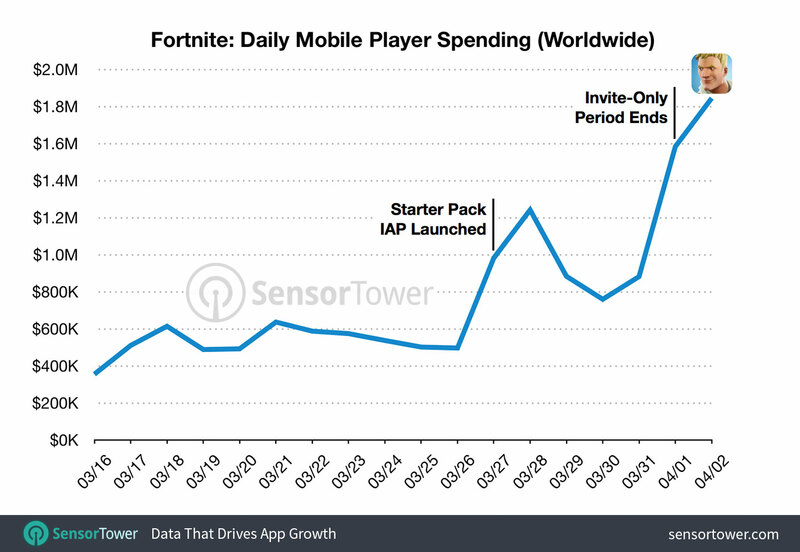 According to market intelligence firm Sensor Tower, Fortnite is one of the most successful mobile launches ever. Since it began monetising on March 15, the total worldwide revenue for Fortnite mobile has exceeded $15 million gross, with about $10.5 million paid to Epic Games. Global installs of Fortnite on iOS have topped 11 million since launch. It currently occupies a place in the top ten grossing iPhone games in 23 countries. In the US alone, Fortnite has generated more than $6 million over the past seven days. This puts it above Candy Crush Saga ($5.8 million), Clash of clans ($4.1 million), and Pokémon Go ($2.7 million). Fortnite also remains number one in more than 20 regions for iPhone downloads and its popularity should only increase now it is publicly available. "Of course, the question on everyone's minds isn't how much Fortnite can earn, but how much more is it poised to make when it eventually arrives on Google Play," said Randy Nelson, head of mobile insights at Sensor Tower. "If its performance on the App Store to date is any indication, we can easily see the game grossing $3 million or more per day once the Android user base grows to a comparable size in relation to iOS - and that's potentially just the beginning for what started as a surprise release and it already one of the most successful mobile game launches ever."